Eric Lindros is a is a former Canadian hockey player who played for the Philadelphia Flyers, the New York Rangers, the Toronto Maple Leafs and the Dallas Stars. Lindros played for the Philadelphia Flyers from 1992 to 2000. He was a 7-time All Star who was the 4th fastest player in NHL history to score both 300 and 400 points. Lindros also represented Canada at the World Junior Championships in 1990, 1991 and 1992, and won gold medals in 1990 and 1991. Lindros has also represented Canada’s senior team at the World Hockey Championships and at the 1993 tournament lead the squad in scoring. Lindros also represented Canada three times in the Olympics for 1992, 1998 and 2002 for which he won a gold medal in 2002 and a silver medal in 1992. 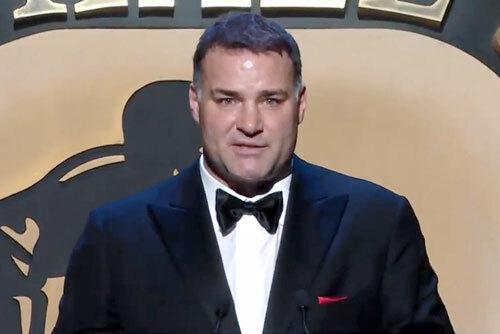 Lindros was inducted into the Hockey Hall of Fame in 2016. Sports Speakers 360 is a booking agent for pro athletes. If you would like to book Eric Lindros for a speaking engagement, appearance or endorsement, contact an Eric Lindros booking agent for fees at 1.855.303.5450.